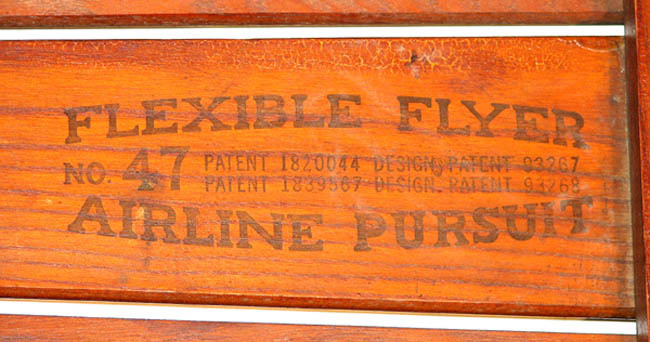 The sleds listed on this Slope (page) are of the Airline Series of Flexible Flyers. 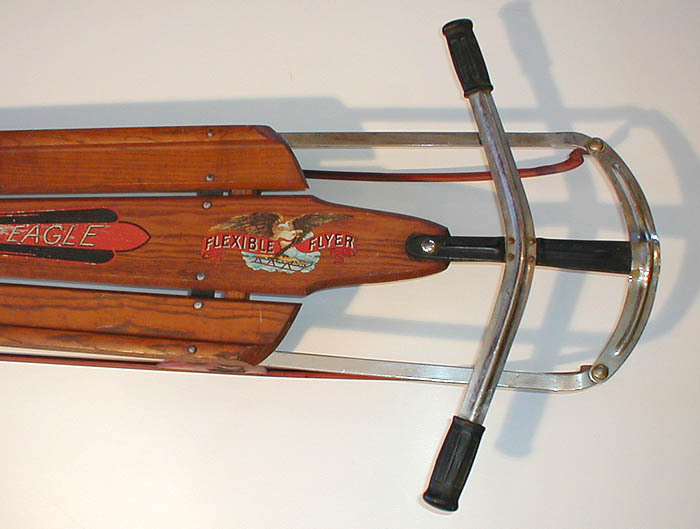 Older Flexible Flyer sleds are on Jon's P 1, which were straight runner sleds. The Airline series was inaugurated about 1935 with the principle design changes being the safety runner and the shape of the boards. The number of model lengths was increased and the graphics changes. To increase loading time, Racer sleds are on a separate Racer page, and sleds by other manufacturers are on Jon's Slope P. 3. FF - Airline Ace The Ace is a 37 inch sled without the independent piece that would allow the deck to slide across the front cross piece. It would seem too short for that mechanism to be effective. 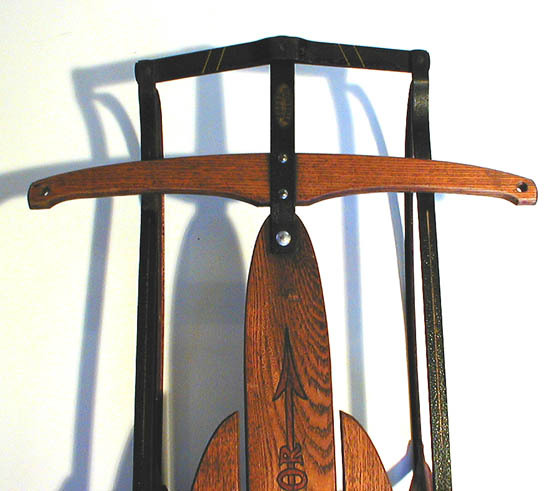 the Airline series entered in the age of returning the runners to the top of the sled at the rear, thereby making them safer and presumably stronger. It cost $3.45 in 1939. FF - Airline Pilot 41 inch sled with a red and black bumper - original condition. Estimated date of about 1950 based on bumper graphic. 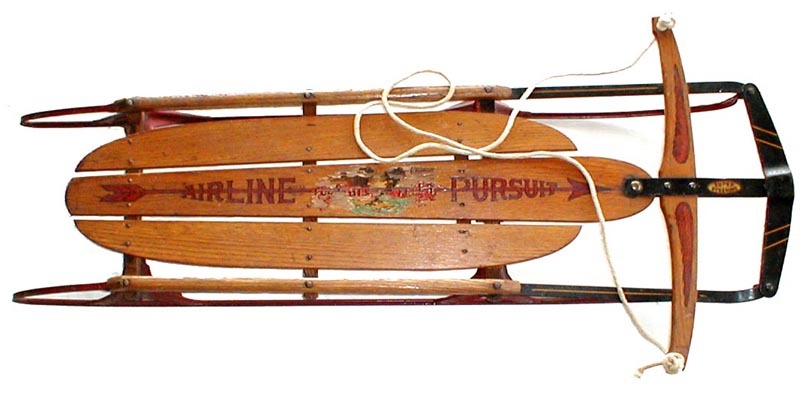 FF - Airline Pursuit 47 inch sled with a rare metal handle. The handle has the width as the Airline Eagle, but the pieces joining to the sled are different. As with the Eagle, the rubber grips are the same as on the Flexy Racer. - original condition. FF - Airline Pursuit 47 inch sled with a traditional black bumper with gold slash lines - original condition. 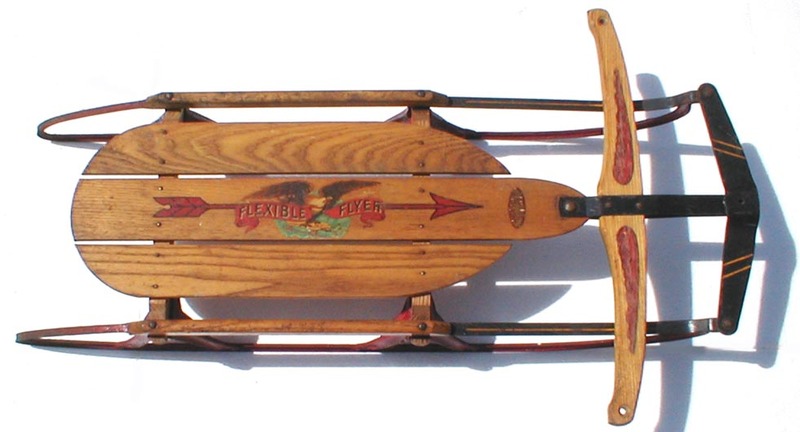 FF - Airline Junior - Series A - 51 inch sled, perhaps one of the very first Airline sleds made. Note that there are no wings on the handle, that the bumper is narrow like the E series before it, and the faint black stripes on the top of the side rails. FF - Airline Junior Later 51 inch sled pictured below, with the traditional gold slash lines on the bumper - original condition. This is a sled that serves as a good example of the identifying information on the bottom, as well as descriptive information, shown to the right. The top appears at the back of the sled and credits the runners and steering. The model and size information appears in the middle of the sled, while the manufacturing label is at the front. All detail is on the middle slat of the sled. FF - Airline Eagle 151 B - Perhaps the flagship of the fleet, the Eagle came in with the new Airline series in 1935, apparently in one size only, the same as the Airline Junior. We were fortunate to obtain this rare sled in excellent condition. There was little rust and two missing rivets at the front of the side slats were quickly replaced from the stock we had obtained from collector Deen Watson. Occasionally rivets would not be crimped over on the bottom and owners would replace them with bolts; but original rivets are better and they are now installed. The Eagle combines the side slat and side deck boards into one sculptured piece that results in a very trim sled. The sliding cross piece that holds the deck boards together is held with rivets rather than nails, similar to the construction of the Tuxedo Racer (see Jon's Racers). The steering is entirely from metal and seems to function better than the regular Airline series. We do not know why the Eagles did not flourish, but they were eventually discontinued. FF - Airline Chiefs Two 55 inch sleds still in use. Quite heavy and very strong. The top sled has the black bumper with yellow stripes and the second sled has the chrome bumper found on the later series from about 1960. 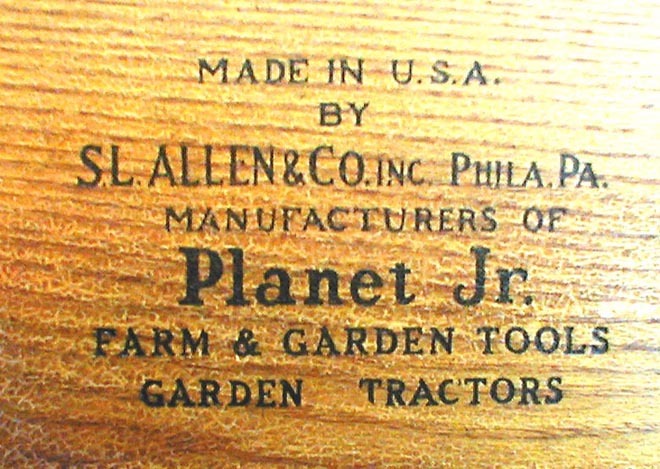 The label below is from the top sled. FF - Airline Cruiser This 65 inch sled was the next to biggest sled ever made by S L Allen. This one did not have the predrilled holes for footrests that some of this size did.